Allusion to the tragic story from Hellenic mythology, where Icarus along with his father Daedalus befled the Cretan labyrinth of Knossos by flying with wings that his father had made from feathers and wax. 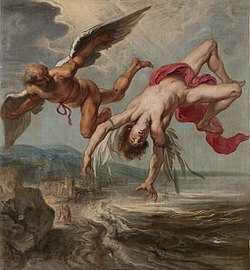 Daedalus forewarned his son of flying neither too low nor too high, that the sea's dampness not clog his wings nor the sun's heat melt them; but Icarus unheeding his father's bidding flew too near to the sun, thereby melting the wax in his wings: so he tumbled out of the sky and fell into the Aegean Sea where he drowned. (idiomatic) To sustain harm, loss or ruin by doing some risky or perilous deed.